Excerpt: Between 1300 and 1550, England was a temporary or permanent home to hundreds of thousands of people of foreign birth. These immigrants – male and female, adults and children – came from other parts of the British Isles, from more or less all the regions of continental Europe, and (especially at the end of the period) from the wider world of Africa and Asia. They settled not just in the major cities and towns but also in rural communities, having a documented presence in every county of England. They numbered in their ranks aristocrats, professional people such as scholars, doctors and clergy, prosperous traders and skilled craftspeople, and numerous semi- and unskilled workers involved in commerce, manufacturing and agriculture. Excerpt: What I propose to do in this study is to take this idea further: not only differences in revealed doctrine but, most importantly, differences in how revelation is understood to come to us established in Christianity, Judaism, and Islam very different epistemes which determine, often decisively, not only how thinkers in these traditions understand the relation between revelation and philosophical reflection, but also the degree to which they are able to arrive at an adequate solution to the often seemingly contradictory claims of both. What revelation is understood to come to us is often the unspoken and yet fundamental horizon in which Christian, Jewish, and Muslim thinkers thought and came to a solution, adequate or not, to key philosophical problems of their time (and all time). Excerpt: This book offers new research on converts in the king’s service and in trade in thirteenth- and fourteenth-century London, on the pre- and post-expulsion finances of the Domus Conversorum, specifically the financial relationship with London. 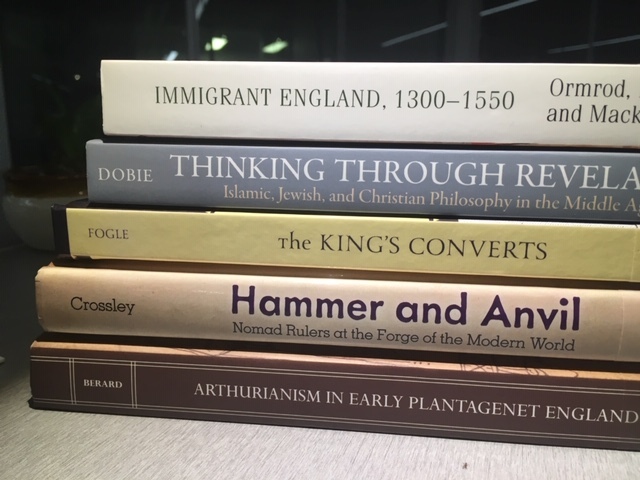 It also includes greatly expanded research on the influence of the Church in English conversion policy, the London Dominicans in particular, on the building and administration of the Domus Conversorum, and on the converts themselves. In addition, this book offers analysis of the relevance of events like the anti-Jewish riots of 1189 (London), and 1190 (York) to conversion. By focusing specifically on Jewish conversion in medieval London, with frequent comparisons to Continental Europe, this book will contribute to the overall understanding of Jewish converts in medieval England, an area of study that, though not completely uncharted, has not been the main focus of large-scale research. Excerpt: This book considers the impact of Turkic and Mongol regimes upon the densely agricultural regions they came to rule, particularly in the tumultuous period that marked the weakening of the cultural and political patterns of the “middle ages” across Eurasia. The rulers drew upon Central Asian traditions to promote vernacular languages, popular religions, and ideological legitimating political authority independently from established religious hierarchies. The effect of these trends was to weaken the institutions of universalized language, scholastic religion, and theologically legitimated rulership that characterized the world we think of as “medieval.” When transmitted to areas peripheral to Central Asian conquest, particularly Europe, they powered changes that, in retrospect, we see as “modern” – building the foundations of our criteria of identity, directing our science toward the fabric of reality, providing the tools for personal education and political enfranchisement. Excerpt: This approach to the study of historical cases of Arthurianism is, by virtue of the topic and source materials, multidisciplinary; however, the questions asked are those of a political historian, namely: when, where, and how did the practice of Arthurianism have political significance beyond its immediate entertainment value? What did the orchestrator of each Arthurian imitation hope to achieve? Who were the intended audience? How effective was Arthurianism as a means of symbolic communication?